Sorry it has taken me so long to post an update from Isla. I've been busy seeing the changes, meeting people (Great to finally meet Wayne and B last night) and doing some work. First six days were rain, clouds, wind and cold. Yesterday the sun broke through and I spent a nice relaxing day at Zama's Beach with the girls. I think today will be another beautiful day. (fingers crossed) I was beginning to think I was going to go back to Minnesota paler than when I arrived. Thought I would post a picture of my first meal. OK.....that was a big one. Ended up picking a smaller fish, but was still delicious!! Can anyone guess where this meal was? Tonight will be a few different Halloween parties. Can't wait and will post pictures tomorrow. Oh you girls are so much braver than me. I thought yesterday was too darn cold to consider going to a beach! I guess the body changes when you move to Isla! I was thinking heating pad to warm the bed last night, but too lazy to get the extension cord from the bodega in the brisk breeze! Enjoy Halloween. I am not going out until the Maya celebration of Day of the Dead in La Gloria Saturday night. I'm SOOOO jealous! As usual, the food looks great. Can't wait for more pics! 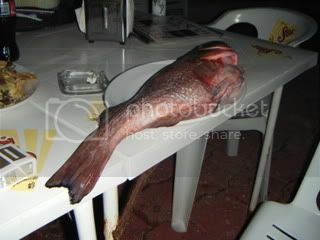 Is the picture of that first fish, cooked? Looks like a shark bit its head off. Doogan. 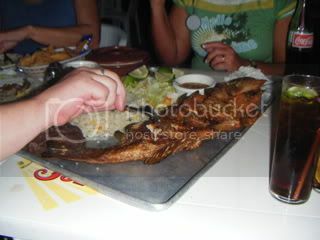 Justicia Social and yes the first fish was uncooked. Not the one we ate though. Getting the apartment closed up and getting ready to go back to "the other place I live." I will definately be doing some big Isla blogs after I return to Minnesota. Had such a wonderful time, good friends, and lots of work done!! OK...signing off before I start crying. Returning to MN even more pale than when you left WOULD have been a shame!!! I look forward to more pictures. OK Mr. Big has had you long enough...get to blogging the details!